This project had been in the ‘pipeline’ ’for several years before coming to fruition in 2017 with the project given the ‘go ahead’ by West Arnhem Regional Council. The area to be re-surfaced was approximately 3200 m². The next important decision to be made was colour selection. Both ourselves and WARC were in agreeance that these courts had to ‘pop’! From the photographs, the correct colour decision was made. As this court was already an existing surface, we ground and washed the surface in preparation for crack repairs, filling of depressions and rectification works to raised areas were carried out before resurfacing of the court. The court was then resurfaced with base coats and finishing top coats. 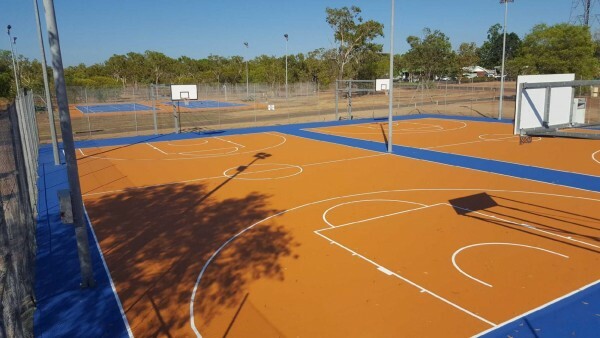 Line marking was applied for two netball, two basketball and four tennis. To complete the project, we also supplied and installed 4 new basketball backboards, 2 pair round netball posts with rings and nets, 2 pair of tennis posts painted black as well as 2 new tennis nets.